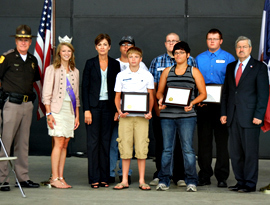 Eighteen Iowans were presented with special awards from Governor Branstad in Des Moines today for their selfless acts that likely saved the lives of others. One of honorees, 41-year-old Jonathan Jones of Lisbon, was killed as he helped save two young boys from drowning in the Cedar River last summer at Palisades Park near Cedar Rapids. His mother, Deborah Jones, says it’s a bit of a mystery why Jonathan was at the park that day. “He planned on going to Lake MacBride to go fishing, but something told him to go to Palisades Park,” Jones said. “I don’t know why…there was a girl we knew (at Palisades) and she told me (Jonathan) said ‘I don’t know why I’m here. We don’t come here. I don’t like rivers. '” Jones’ mother believes “divine intervention” was at play. The Governor and Lt. Governor with lifesaving award winners from Knoxville. “It was God’s plan and I think that’s the only thing that gives me comfort,” Jones said. Three other people who helped Jonathan Jones rescue the boys, ages 6 and 9, were also presented with Governor’s Lifesaving Awards. Five teenagers from Knoxville in south-central Iowa were recognized for their actions following a school bus accident back in January. Cody Long remembers the bus driver spotting a car that wasn’t slowing down at an intersection and was on a collision course with the bus. There were 16 children on board as the bus rolled once and ended up on it’s wheels. Aaron Huffaker was one of the older students who took charge and helped the younger kids out of the bus until emergency personnel arrived. “It was kind of chaotic in our heads, but we were just trying to keep our cool – just to try and keep the others calm because they were freaking out pretty bad,” Huffaker said. None of the children were badly injured. The bus driver, however, suffered multiple broken bones. Twin brothers from northwest Iowa were also honored for their response to a traffic accident late last year. Cameron Peirce of Hinton said he and his brother Riley were driving home when a semi collided with pay loader on Highway 75. The brothers also provided aid to the driver of the pay loader. The semi driver, a man from Texas, survived the fiery crash and Cameron said he received a note from the man’s wife days later. “His wife texted us and told us how appreciative they both were and that she gets to see him come home again,” Cameron said. 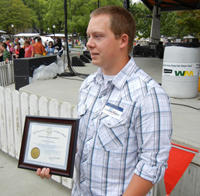 His brother, Riley, was unable to attend the awards ceremony at the Iowa State Fair. The traffic accident last November may’ve been a sample of what’s to come for Cameron. The 20-year-old hopes to be a firefighter. Cameron recently graduated from Western Iowa Tech Community College with a degree in Fire Science.